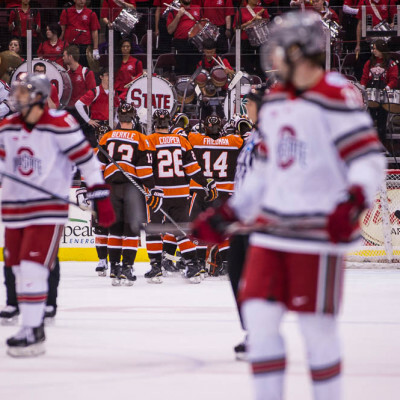 After a disappointing last-minute loss to the Buckeyes on Friday the Falcons got retribution in Columbus. 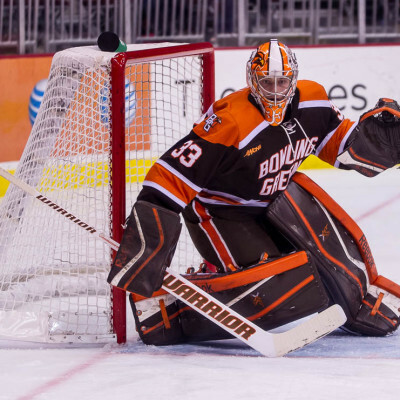 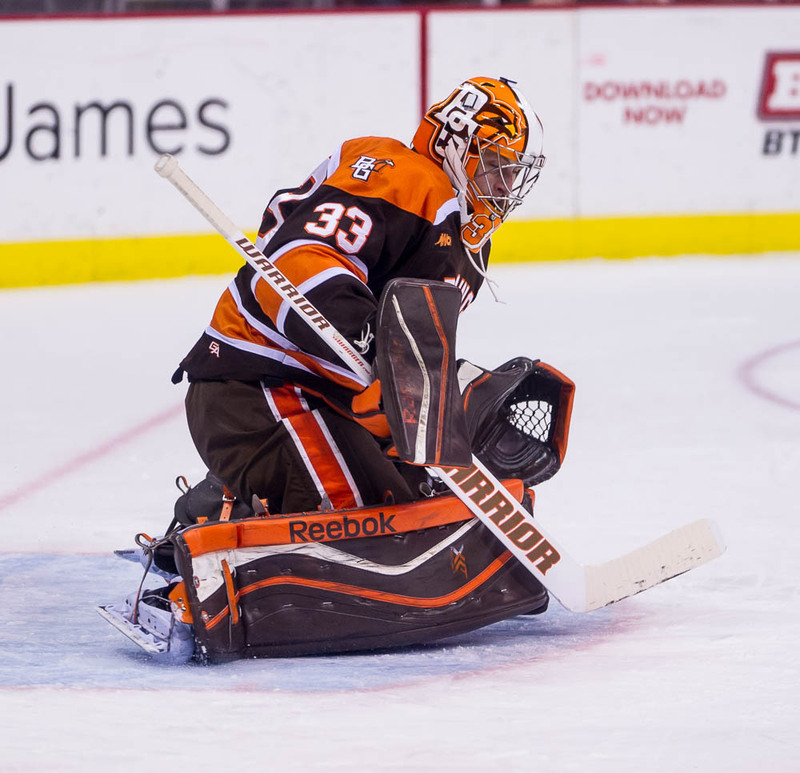 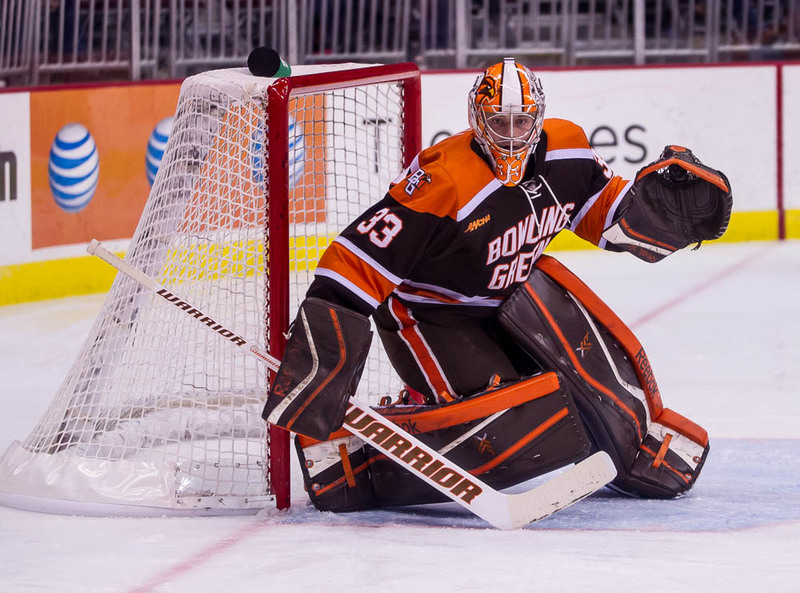 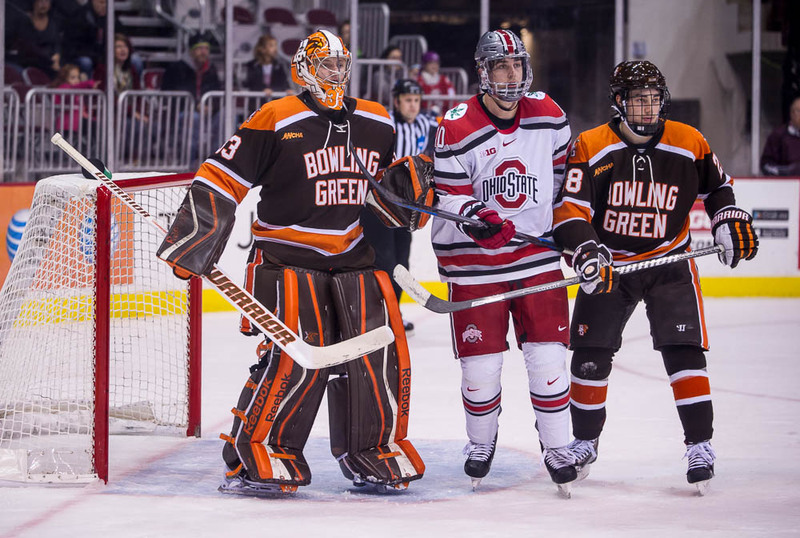 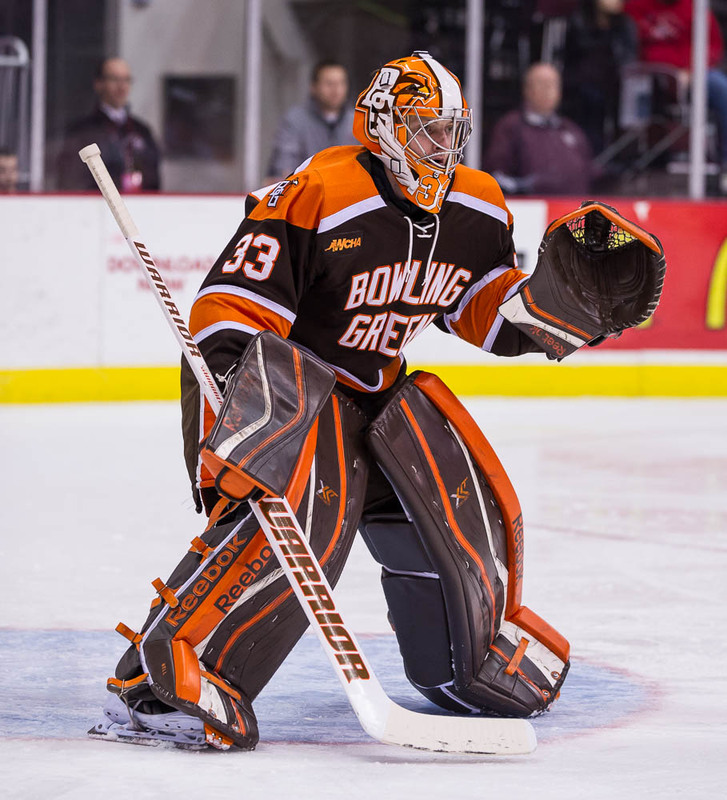 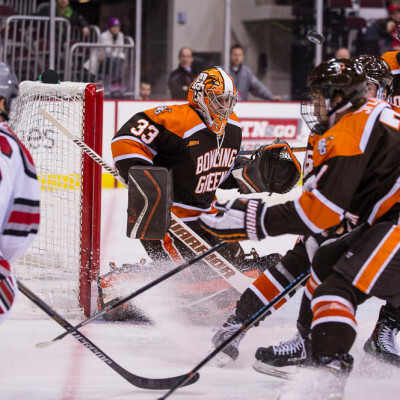 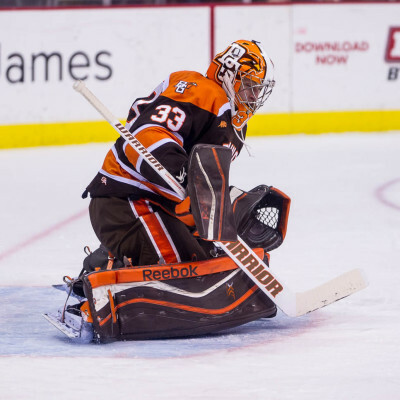 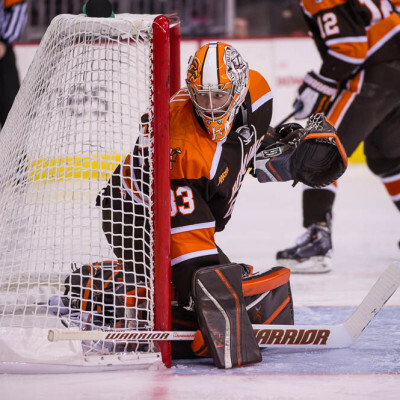 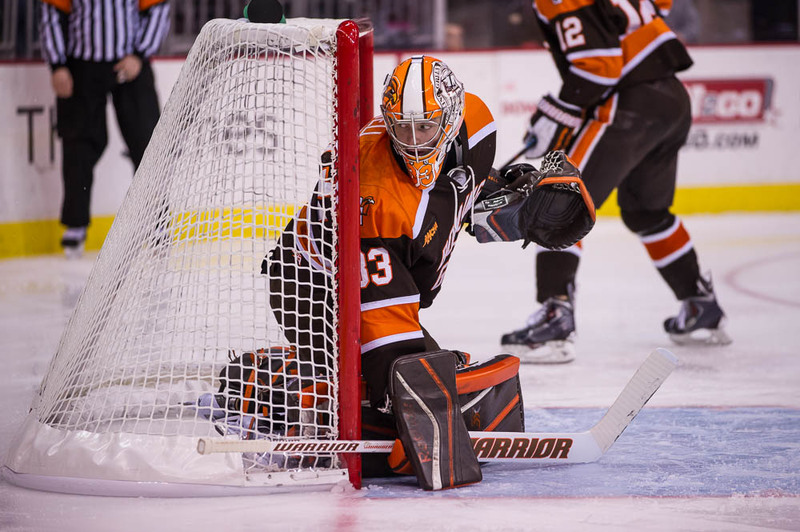 Chris Nell made his third start of the season stopping 27 shots on 29 attempts while Ohio State countered with Christian Frey who made 27 saves on 30 shots. 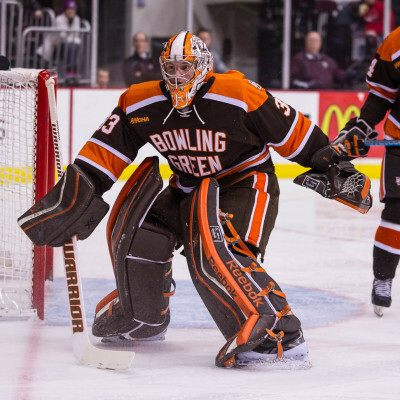 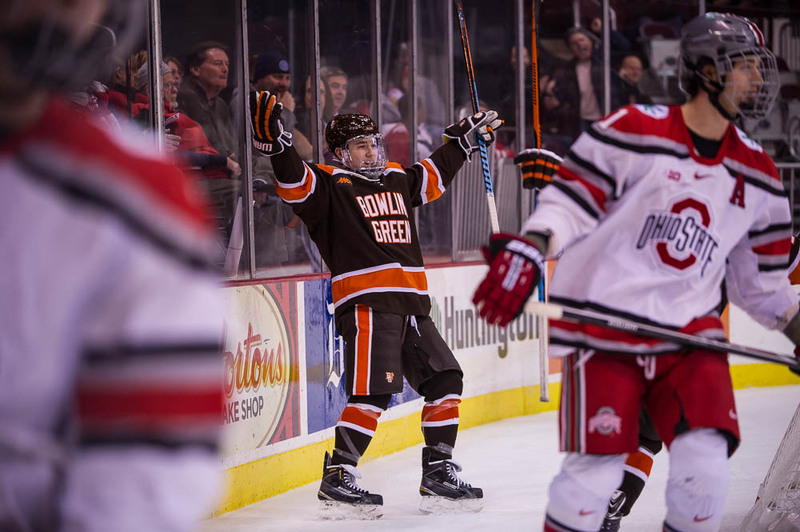 Bowling Green struck first at 10:59 of the first period. 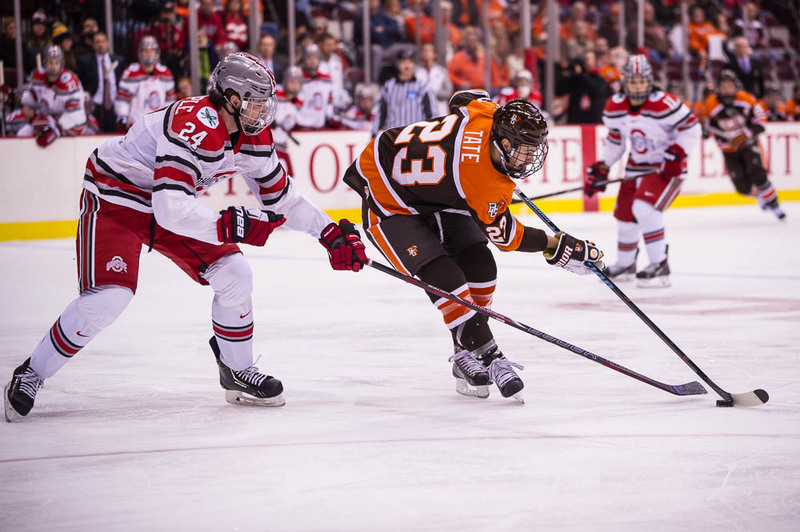 Jakob Reichert passed back to Mike Sullivan at the blue line. 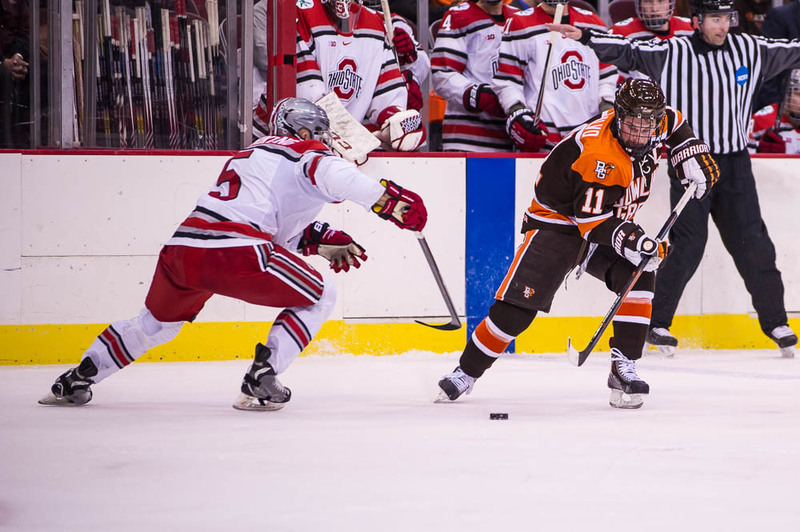 The senior defensemen skated in to the top of the face-off circle and wristed a shot pass Frey. 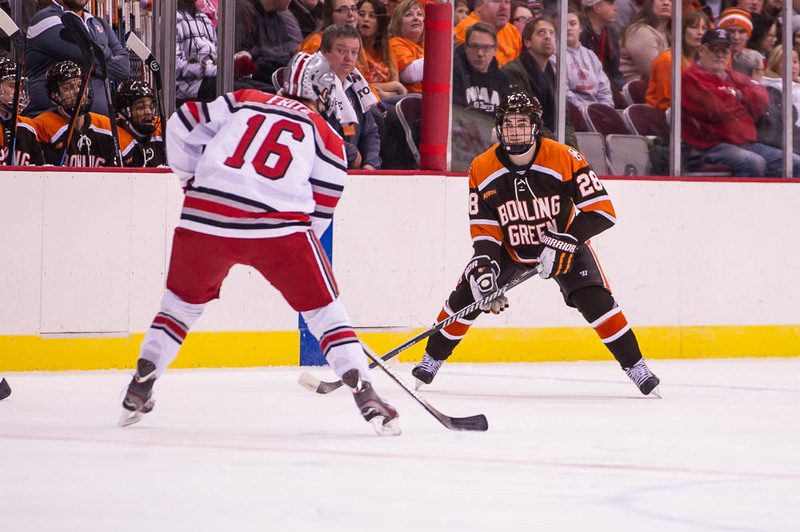 The goal was Sullivan’s first of the season and fifth of his career. 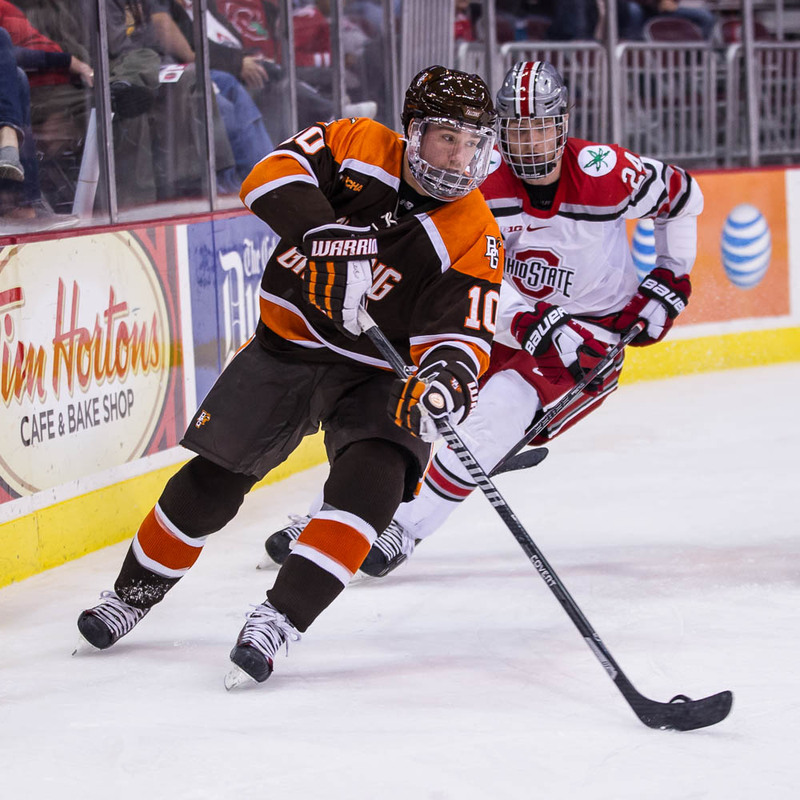 The Buckeyes struck back at 15:28 of the first period as a Tyler Lundey face-off win led to an immediate slap shot from defenseman Josh Healey who beat Nell. 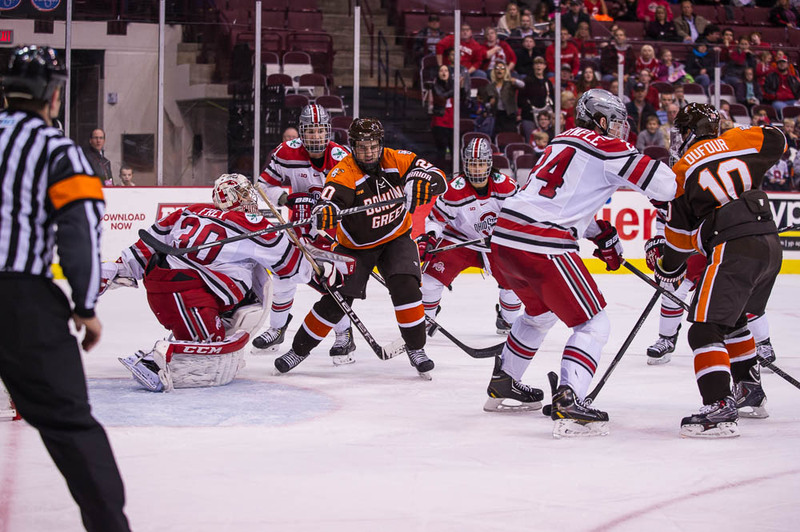 Nell stopped 13 of 14 Ohio State attempts in the first period while Christian Frey turned aside seven of eight Brown and Orange shots. 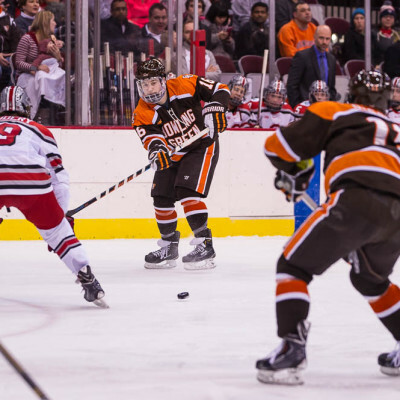 The Falcons scored their second of the game at 17:32 while on a five-on-three power play. 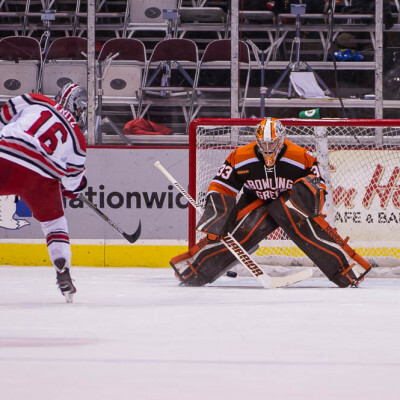 Pierre-Luc Mercier passed to Dan DeSalvo who passed across the blue line to Sean Walker. 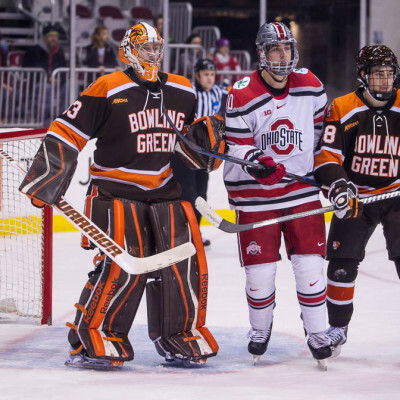 Walker fired a shot on net that glanced off a Buckeye skater and found the net. 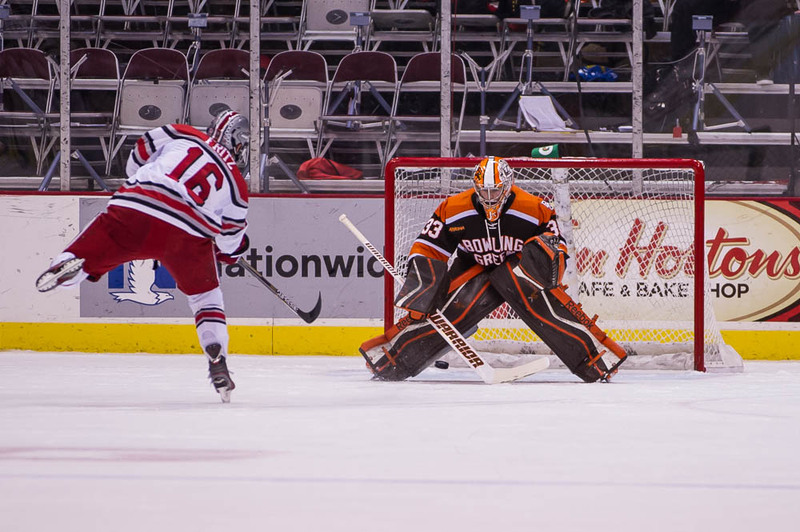 Nell only faced one shot in the second period and made the save. 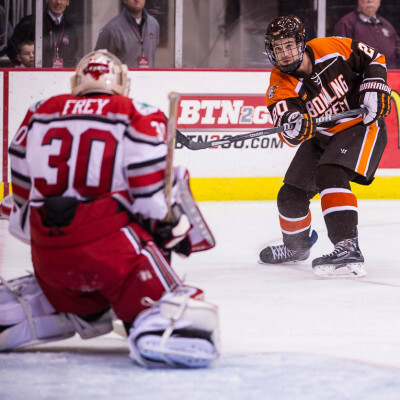 Christian Frey was significantly busier making nine saves on ten shots. 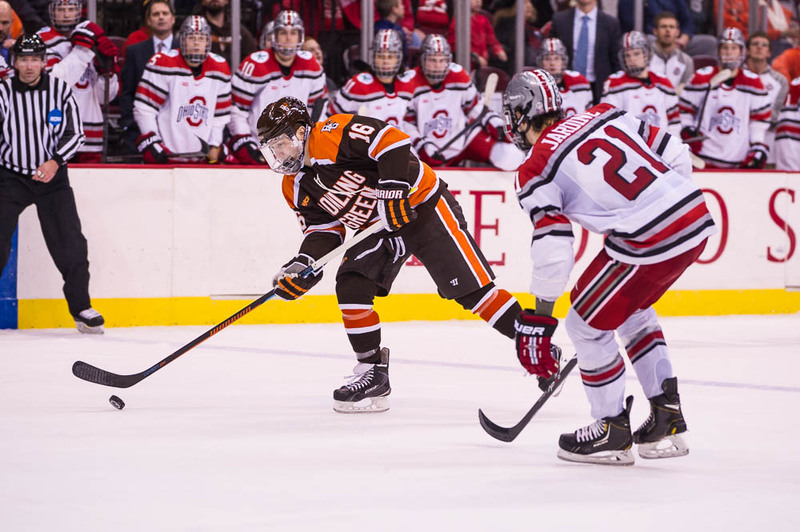 Ohio State was able to tie the game late in the third period as Sam Jardine fired a wrist shot from deep on the blue line. 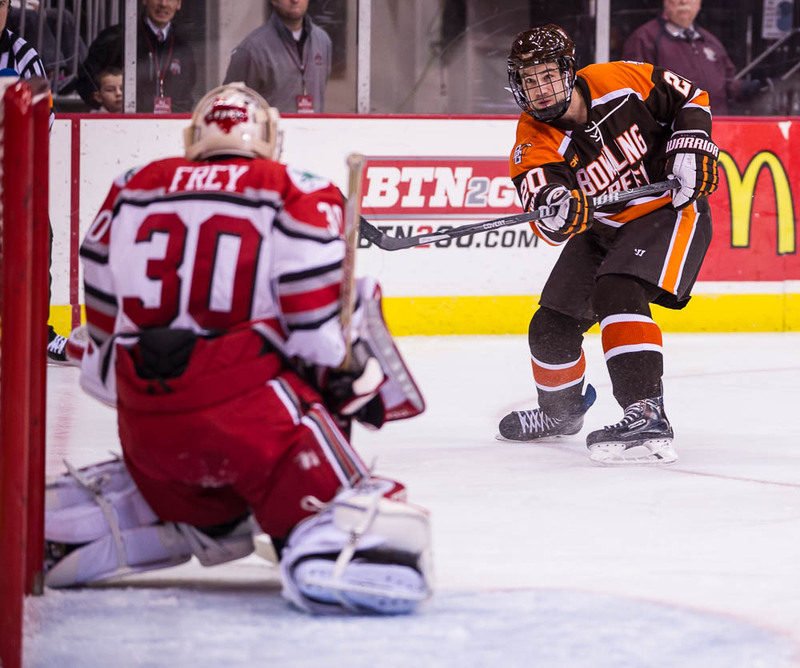 The puck deflected off Nick Schilkey’s stick and beat Nell low. 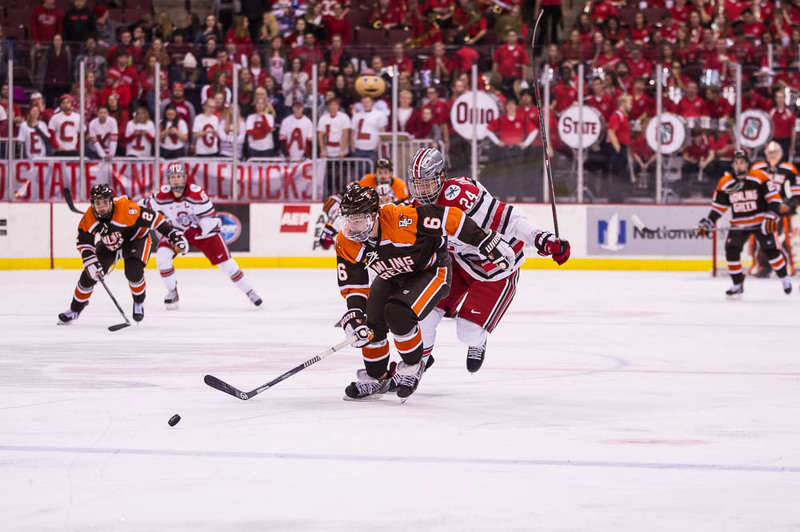 The play was reviewed for a lengthy period as the officials looked for a possible high stick but the goal was upheld. 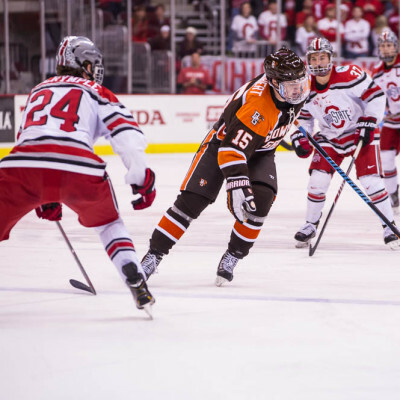 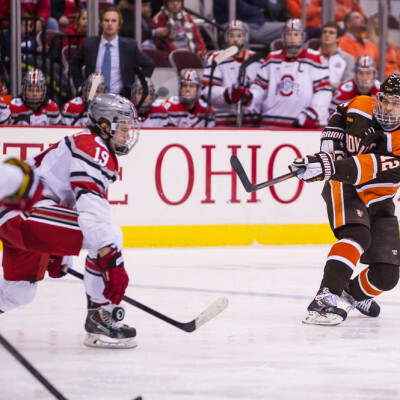 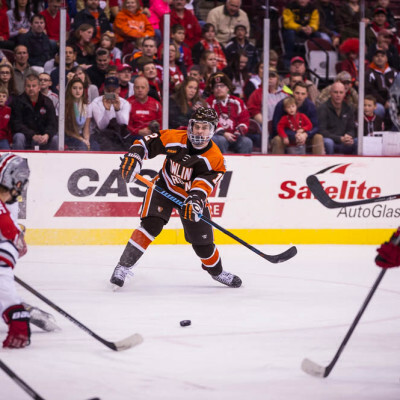 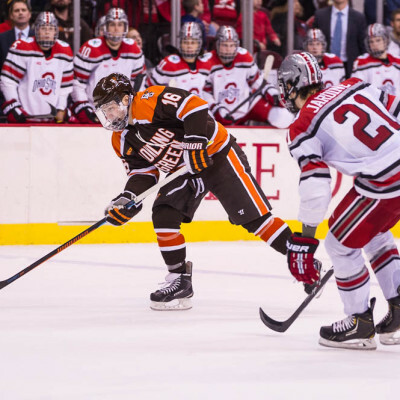 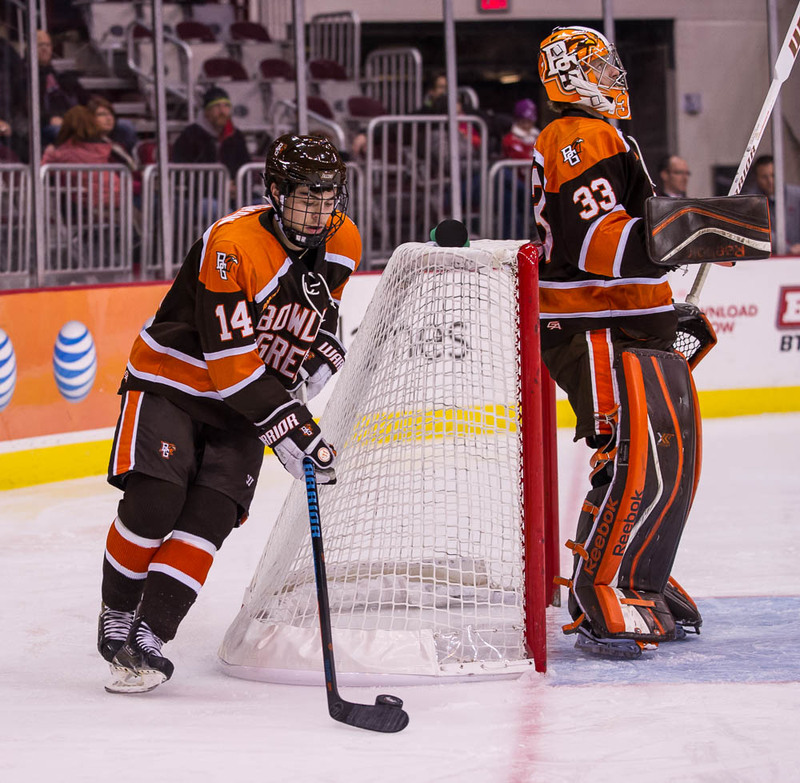 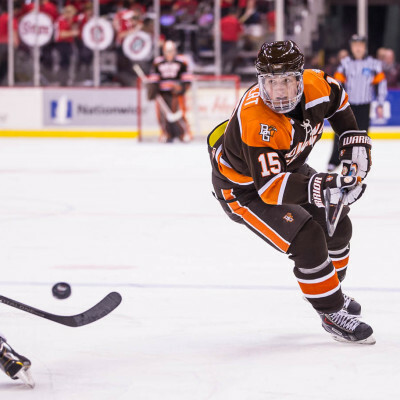 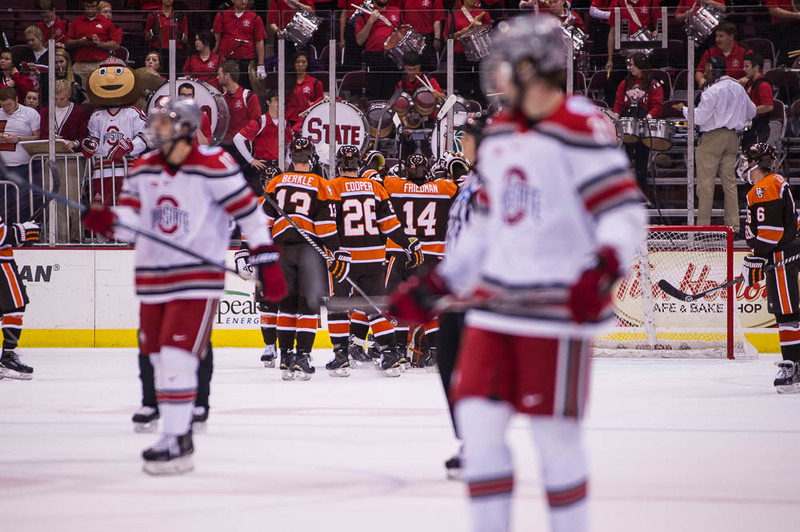 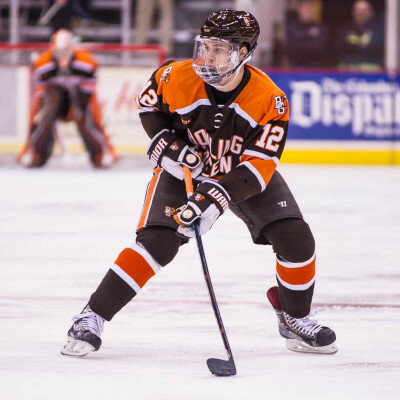 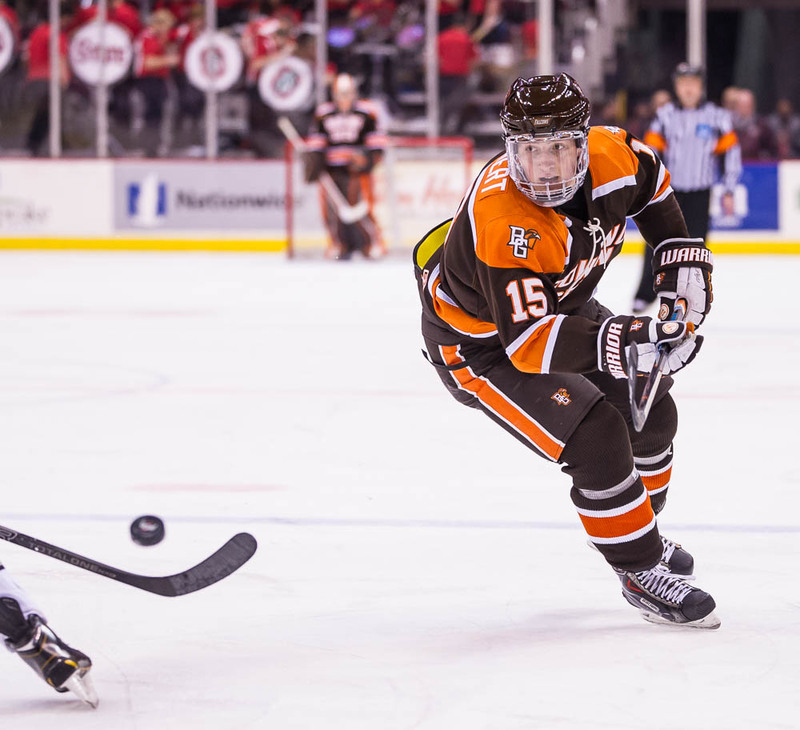 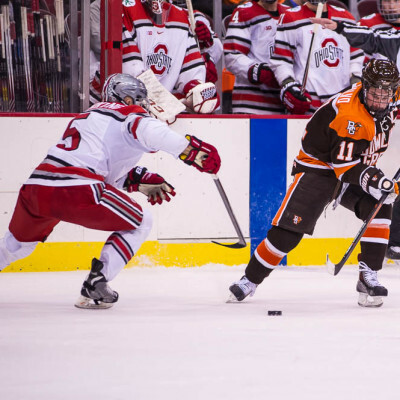 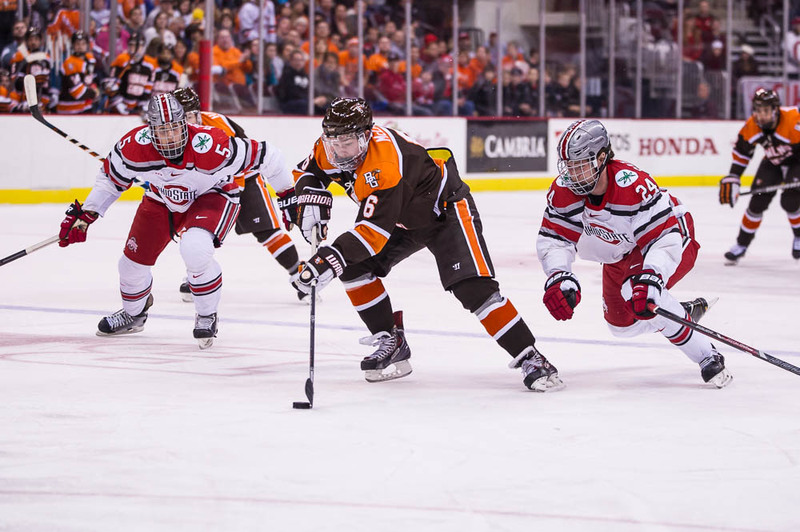 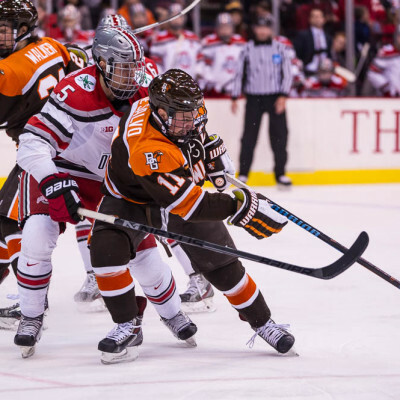 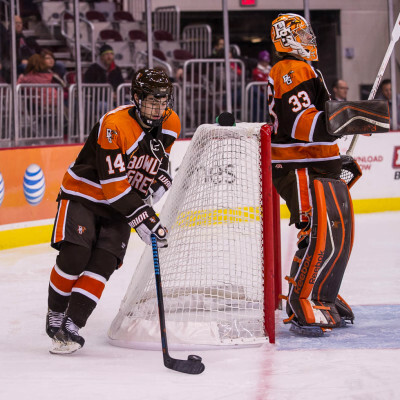 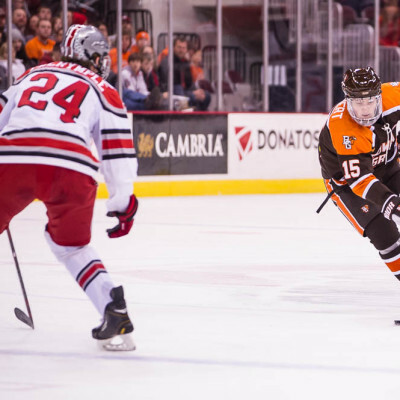 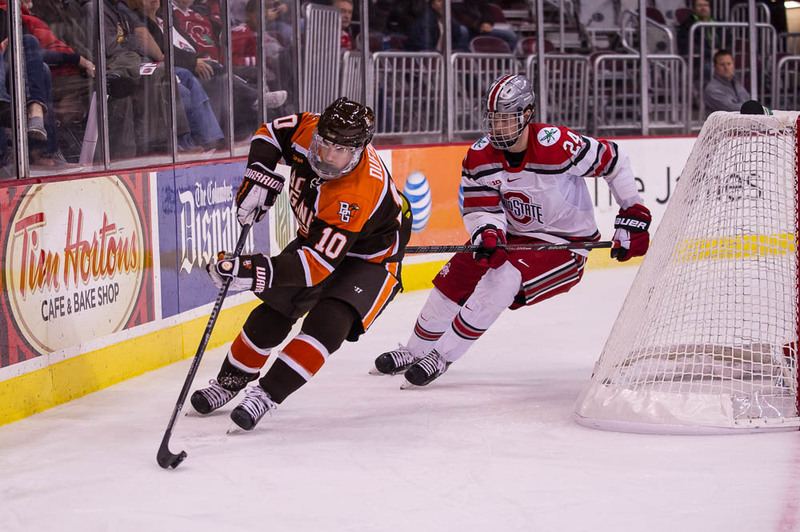 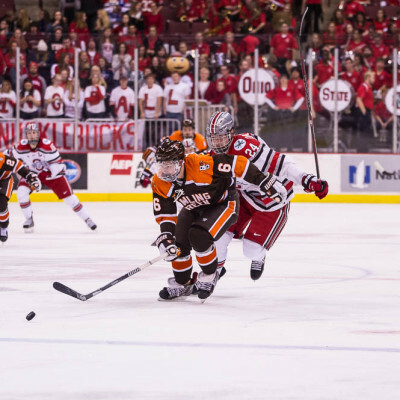 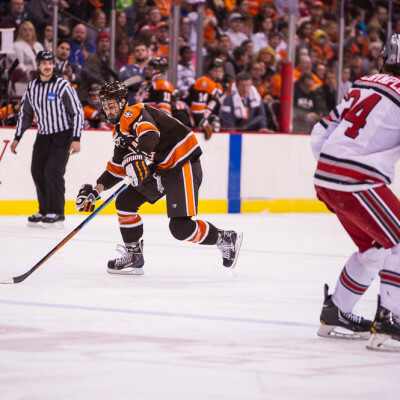 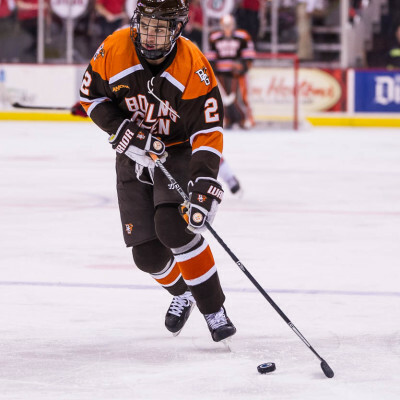 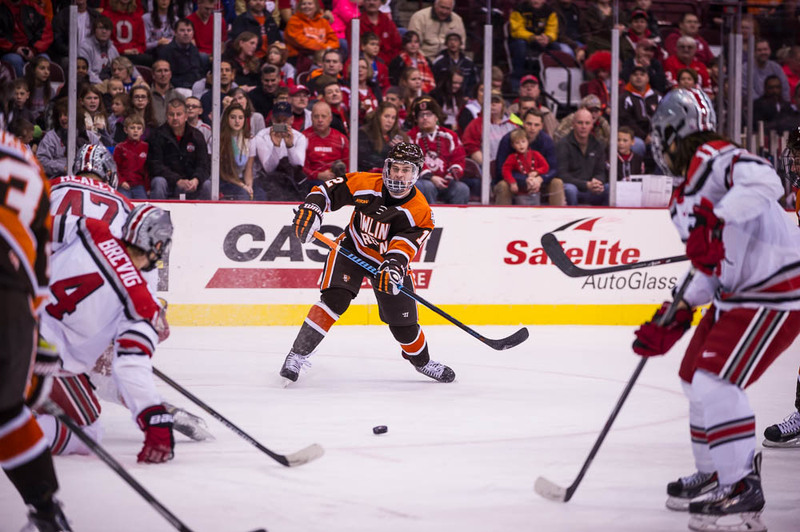 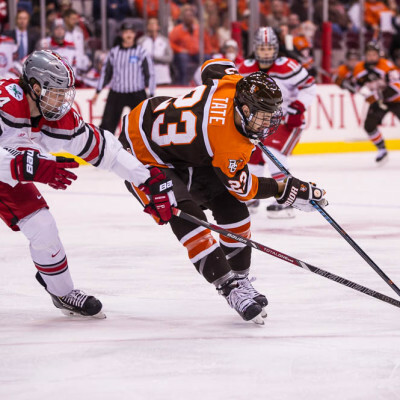 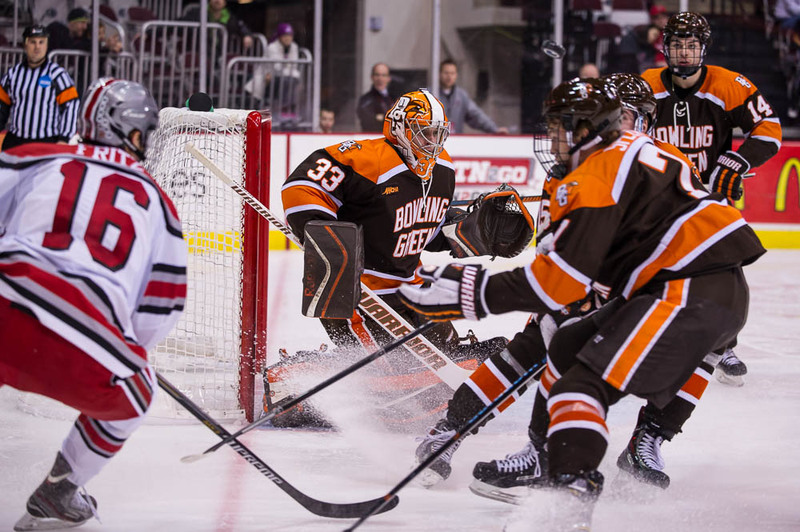 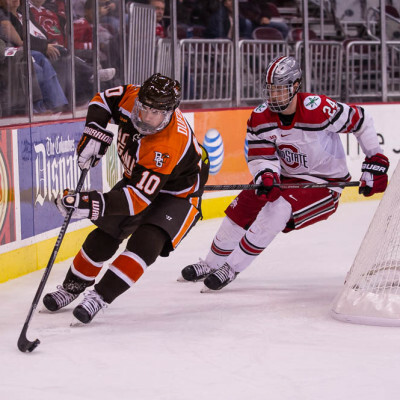 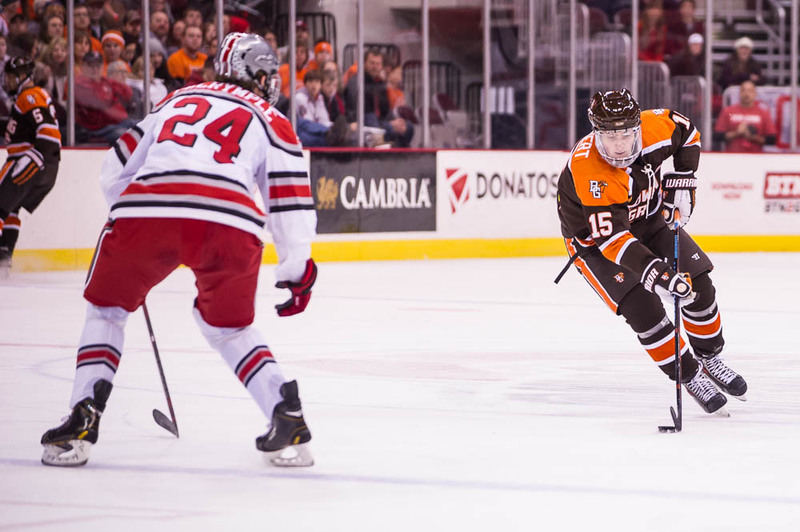 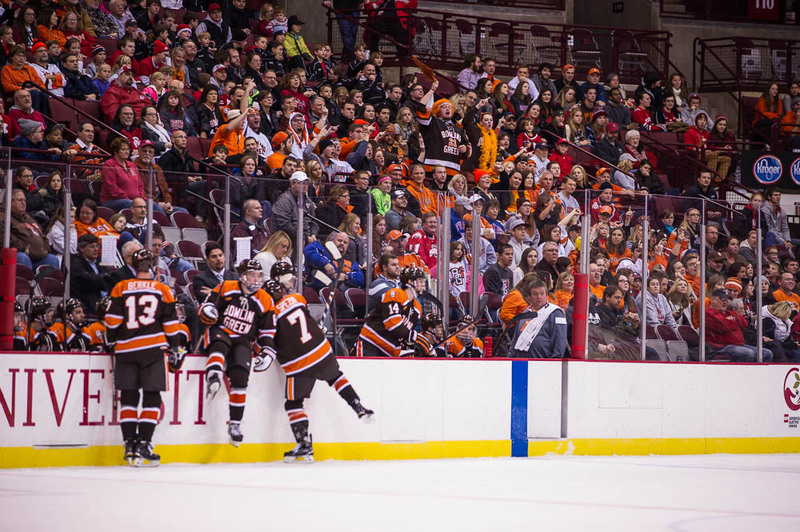 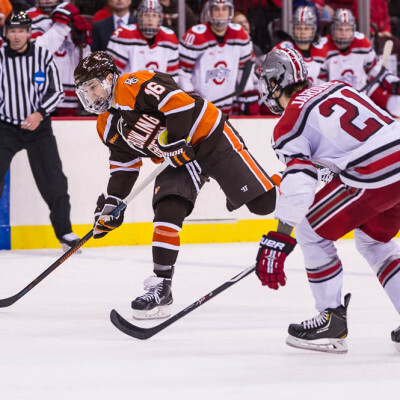 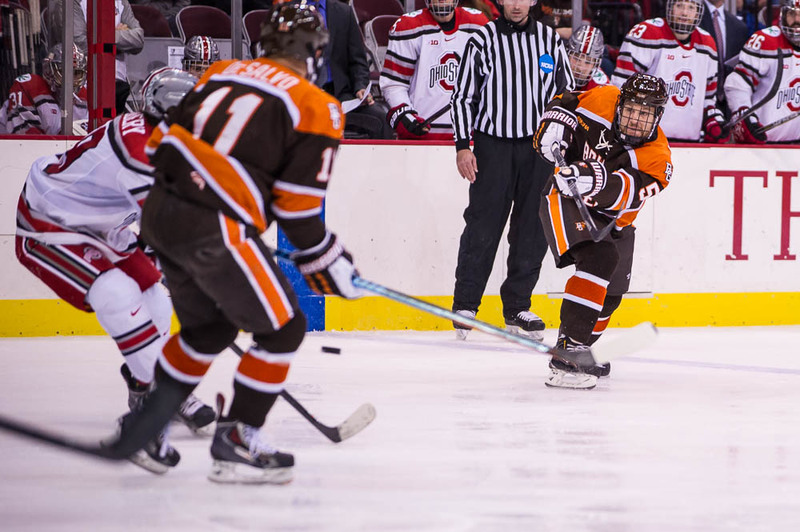 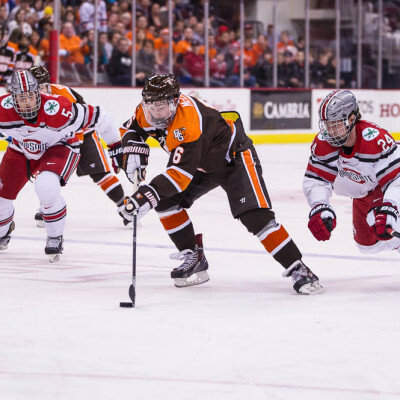 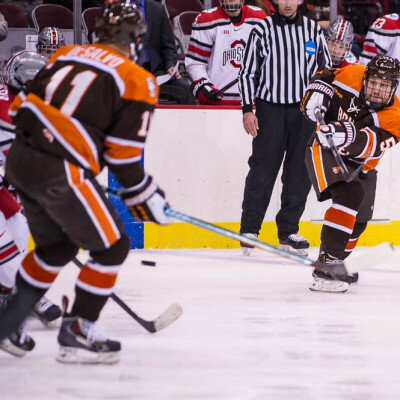 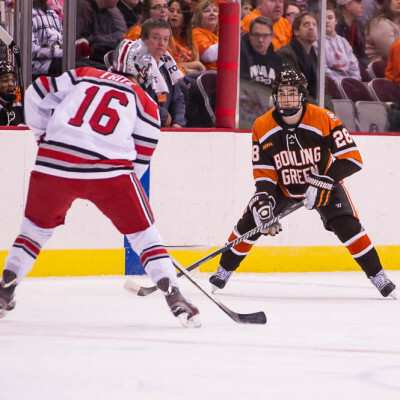 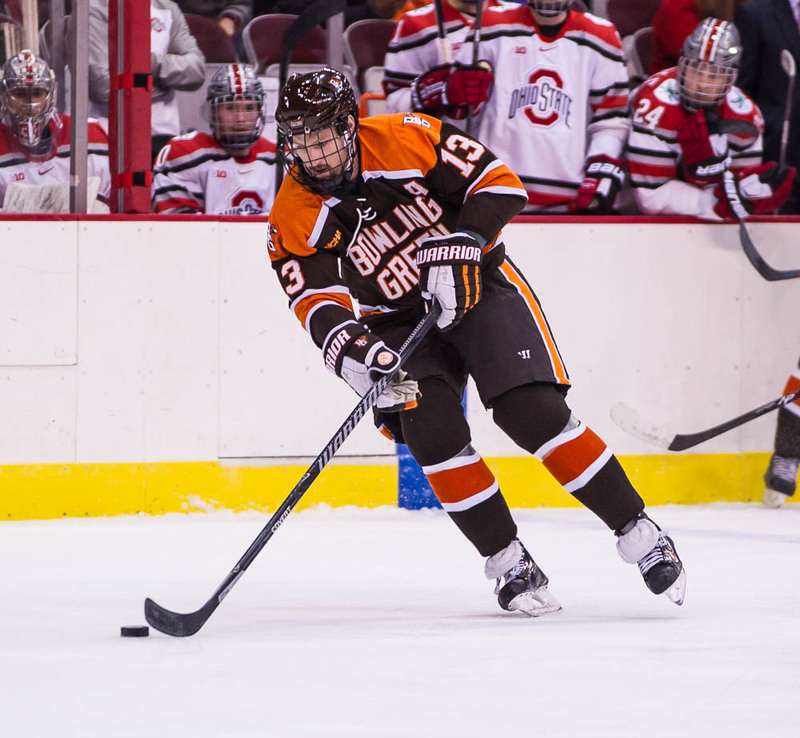 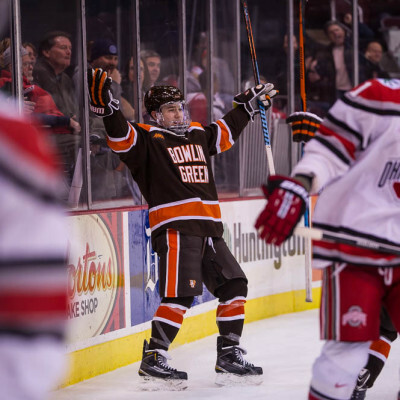 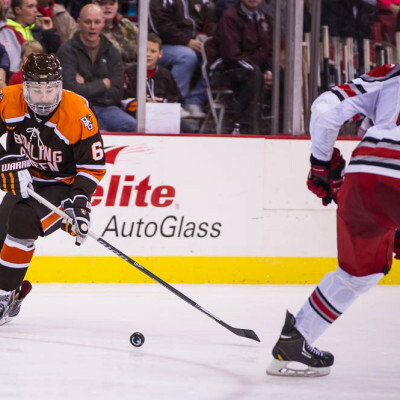 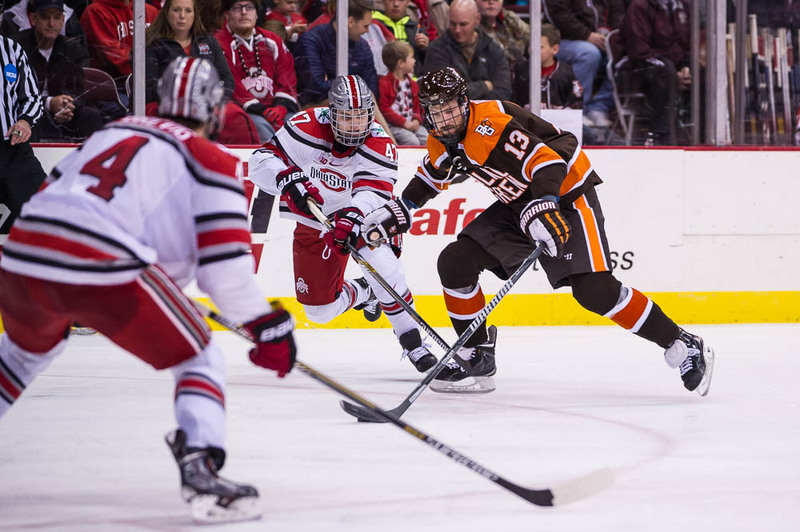 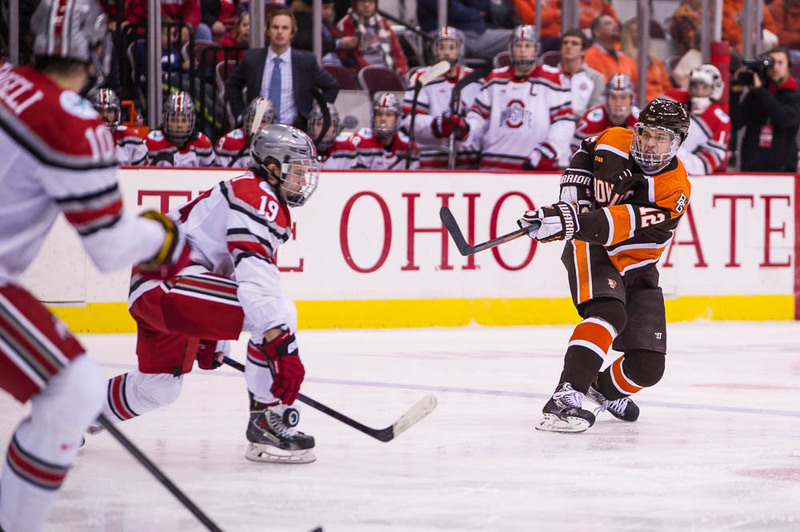 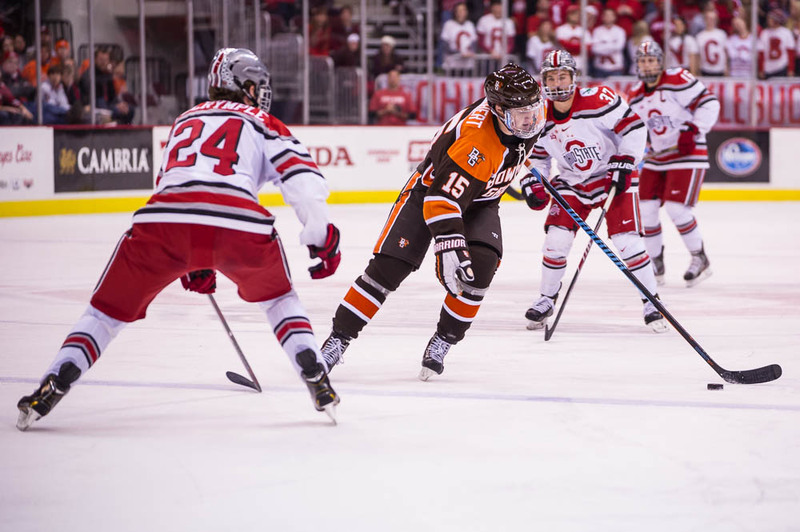 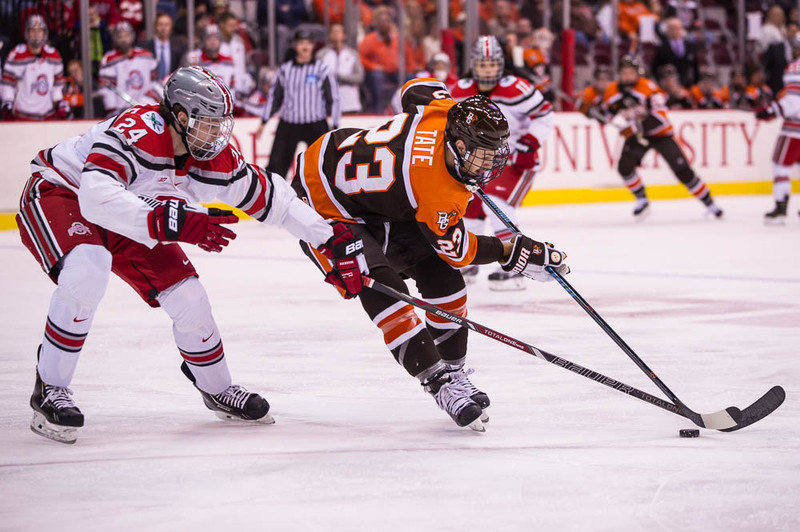 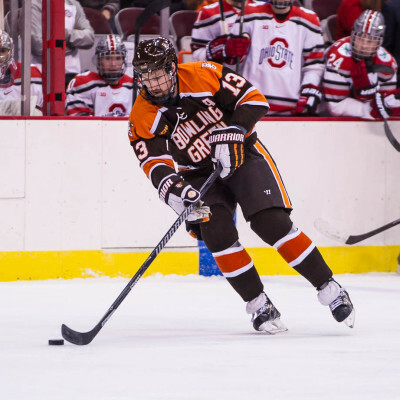 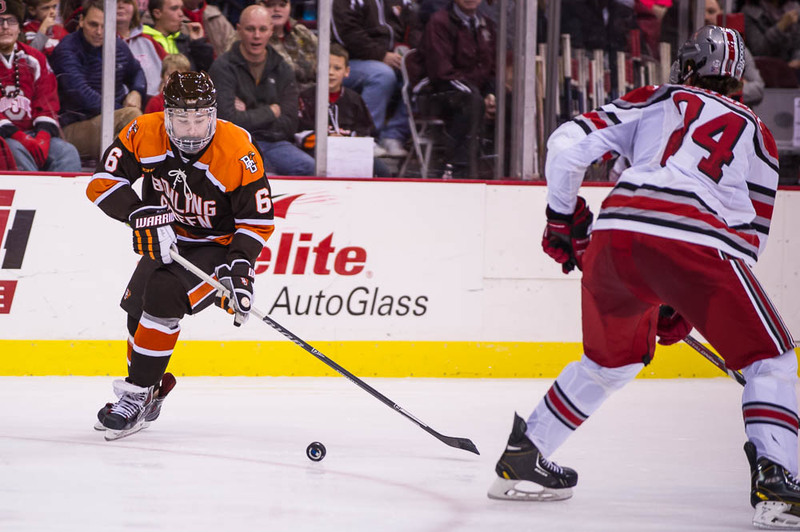 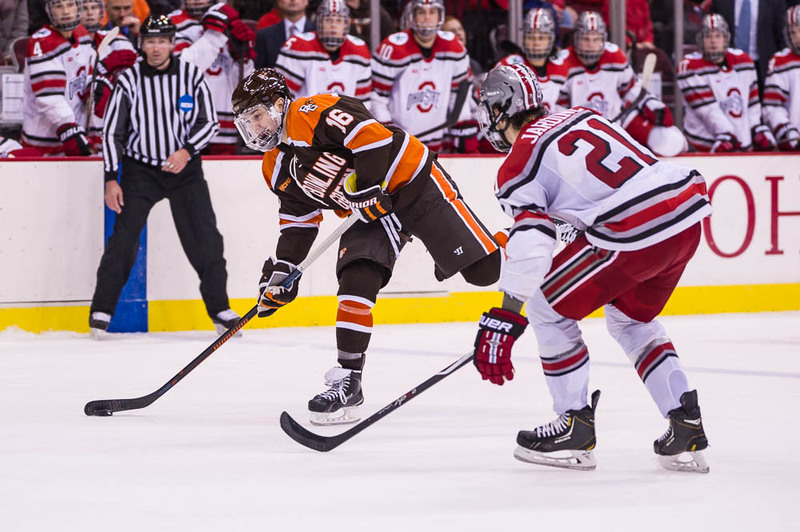 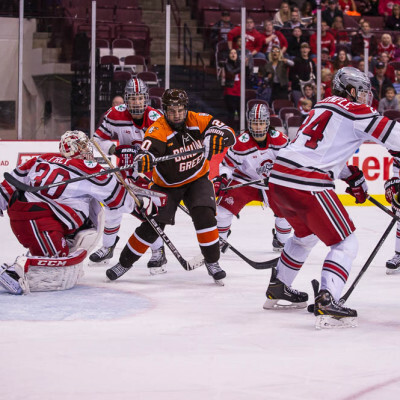 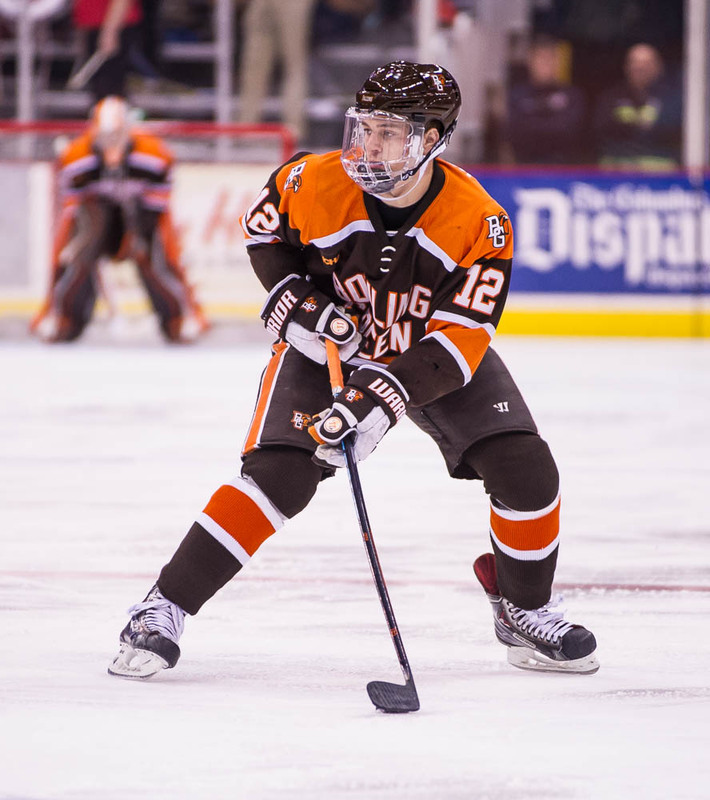 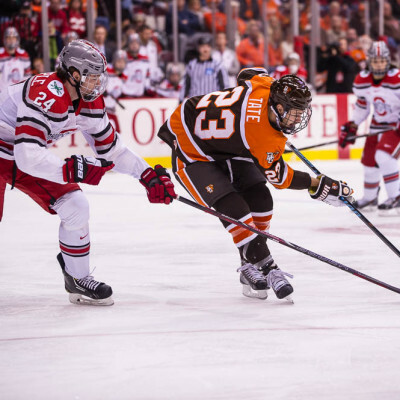 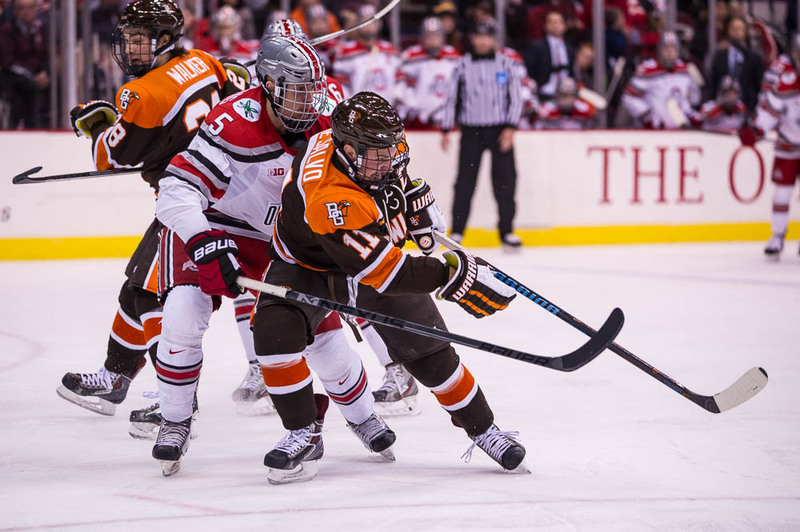 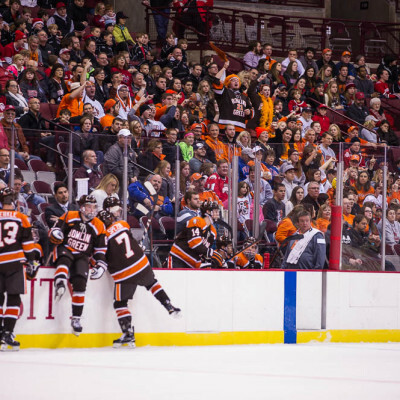 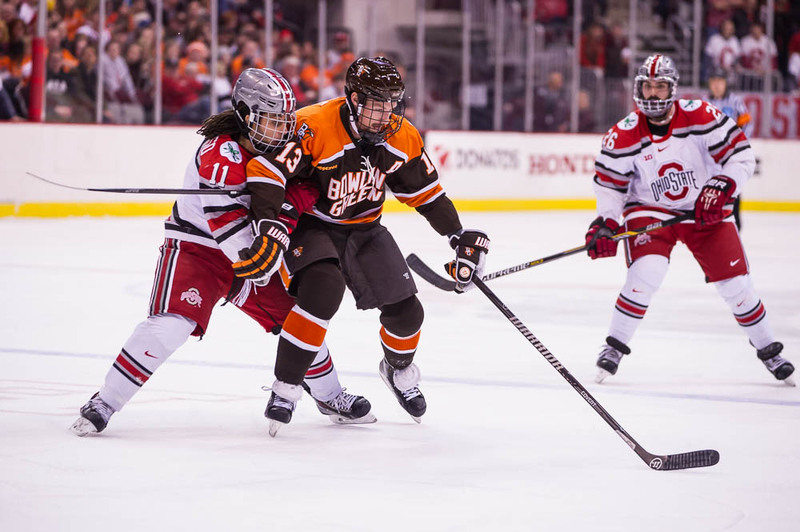 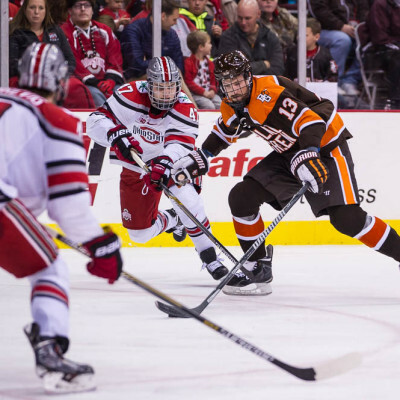 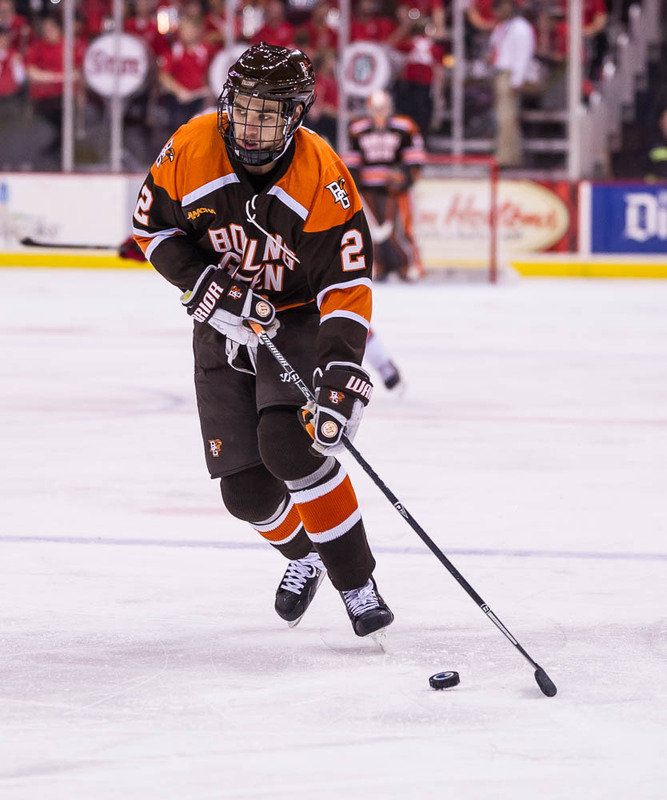 The Falcons would strike back less than a minute later though as Brandon Hawkins skated between a pair of OSU skaters and wristed a rocket past Frey. 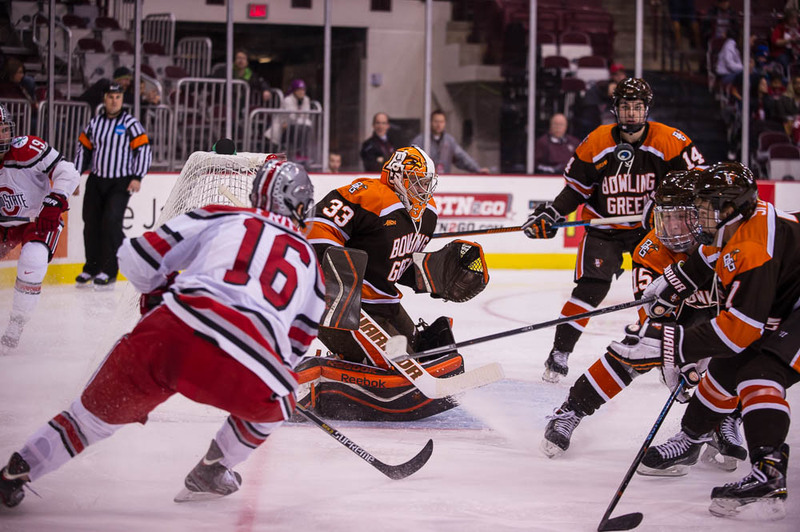 Hawkins fourth goal would stand as the game winner. 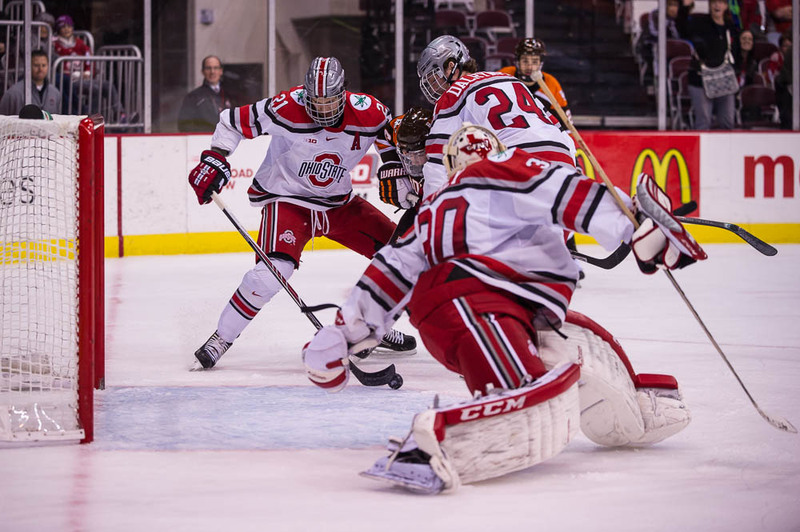 The Buckeyes had a flurry of late attempts with Frey pulled but the freshman net minder turned them all aside for the victory. 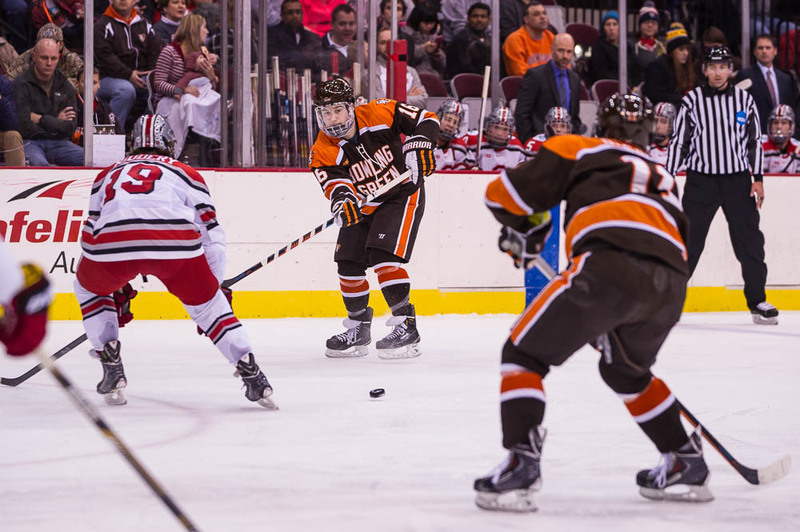 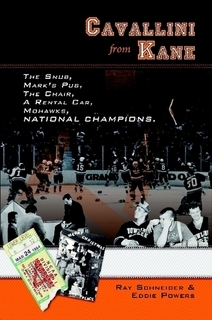 – The Falcons (8-3-1, 5-1-0) were 1/7 on the power play with Sean Walker’s goal coming on a five-on-three. 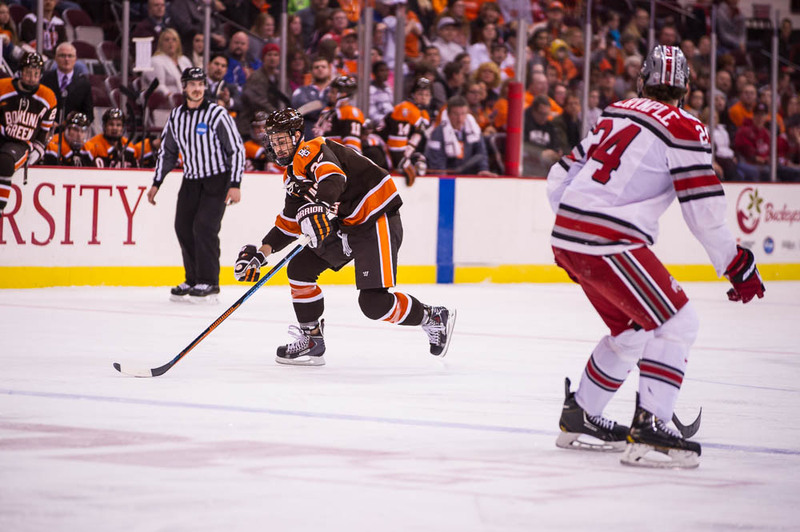 The Falcon’s last power play goal occurred on 10/25/14 versus Clarkson. 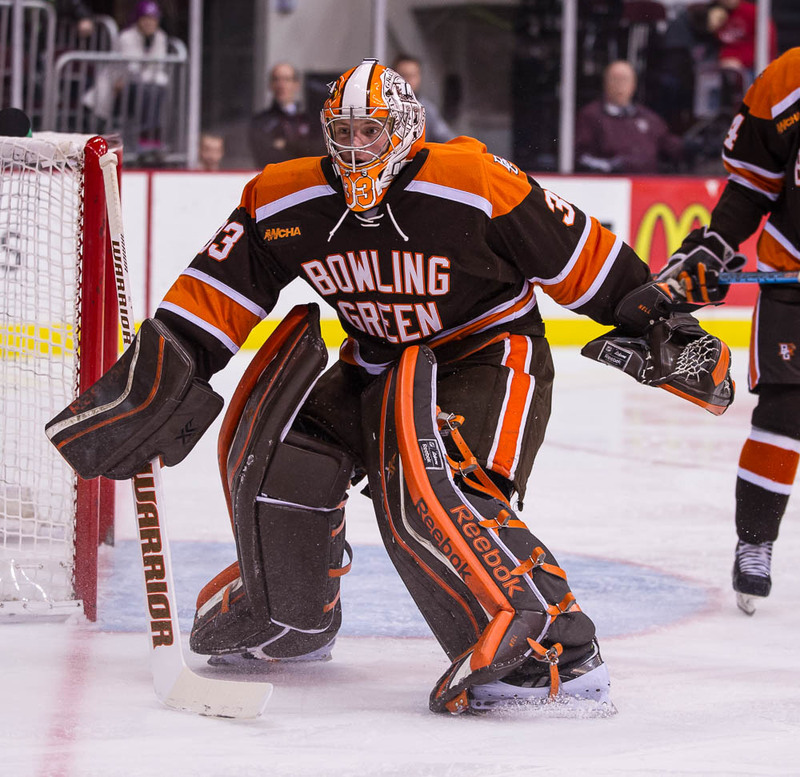 – With the win Chris Nell moves to 3-0 on the season with a 2.00 GAA and a .928 save percentage. 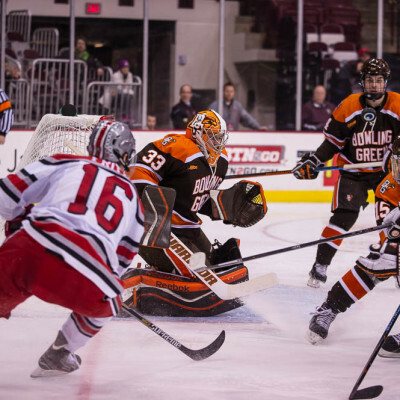 – The Falcons are now 8-2-0 when scoring the first goal and 6-1-0 when taking a lead into the third period. 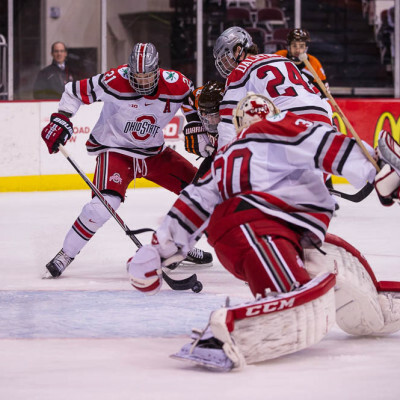 – With the loss the Buckeyes fall to 3-6-1 with a 1-5-0 mark in Value City Arena. 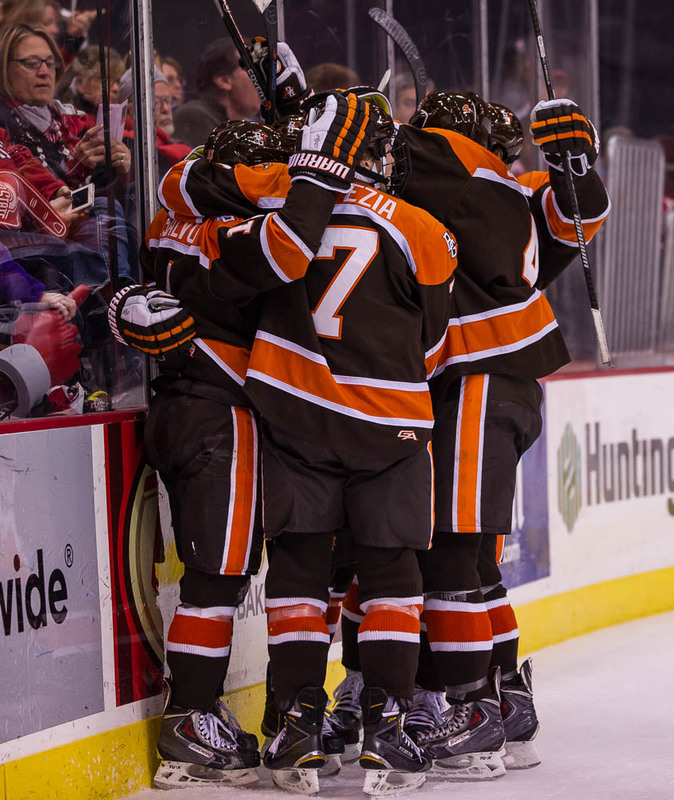 The Falcons are now 6-1-1 on the road.